Trigun is one of the few anime shows that was more popular in North America than in its homeland of Japan. Most people were introduced to it through Cartoon Network's Adult Swim block in 2003, and it's maintained its popularity ever since. While it doesn't have the best animation--I would consider it one of Madhouse Studio's lower-tier efforts--it does make up for it with a heartfelt story and some fantastic characterization. 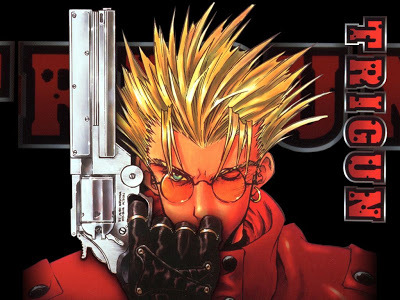 The story takes place on Gunsmoke, a dusty desert planet, and revolves around a man known as Vash the Stampede AKA The Humanoid Typhoon, so-named because of the astronomical collateral damage that seems to constantly surround his presence. Eventually, Bernadelli Insurance Society takes note of this and sends two employees, Milly Thomson and Meryl Stryfe, to follow him around and hopefully stop him from destroying things and costing them money. It turns out that Vash has a bounty on his head to the tune of sixty billion double dollars, and that's why he seems to attract so much trouble. 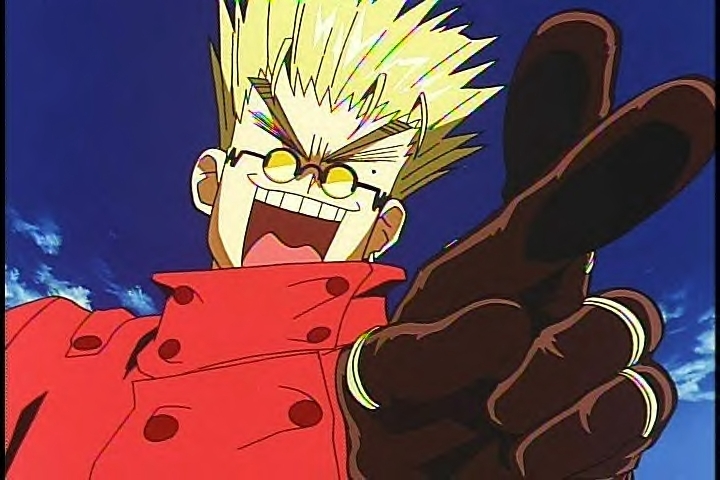 Vash is a hilarious character as his normal demeanor is light and goofy which the show plays up a lot in the first third or so. He can be serious when the situation calls for it, but he will do anything in his power to diffuse a situation non-violently. He's an amazing gunslinger but for some mysterious reason he is extremely reluctant to use his skills. This reason is revealed in the last 4-5 episodes in the series and it recontextualizes the earlier events in a compelling way. Vash has been putting up a facade in order to bury tragic past and is living a lie. A noble lie, but a lie all the same. Vash's back story and character arc reminds me a lot of Rurouni Kenshin, another show that was out around the same era. They both have a pacifist protagonist who refuses to fight due to a violence-filled past. The idea that violence begets more violence is explored extensively in Trigun, as the world that it paints is tough and unyielding. Although the populace is trying to live peacefully with each other, the scarcity of food and water makes barbarians out of some folk. It's an Old West style "eye for an eye" world and Vash is idealistic enough to want better for everyone. He is forced over and over again to witness brutality and it's heartbreaking to watch him grieve for every single life that is lost. Not one person is insignificant and a single death is just as painful as a multitude. The character designs are fantastic and it has that trademark Madhouse wackiness to the villains. Vash's spiked out blonde hair, zig-zag sunglasses, and long crimson red coat are iconic--you will still to this day see at least one Vash cosplayer at any convention you go to. The main foes of the series are the Gung-Ho Guns, a group of powerful gunslingers each with their own gimmick. When the action gets hot and heavy the animation is pretty fluid, but there are a lot of static shots thrown in as well. There is also a tendency for things to look off-model and the proportions can be way off. The music, by guitarist Tsuneo Imahori, is excellent and is a mixture of jazzy blues riffs and more experimental noise work. This series holds fond memories for many older anime fans and with good reason. It's a compassionate and well told tale that asks the question: is there ever really a good enough reason to take a life?